Mindfulness: the experience of being fully here, in the present moment with your children in a friendly and attentive manner. This does not mean sitting in silence on a chair or cushion. Parents can apply mindfulness while cooking, teaching, parenting, even while they are on the phone. The exercises are particularly suitable for parents of children under 18. They provide rest and focus, the opportunity to do what is necessary in the moment. The exercises in this book vary in length from 1 – 10 minutes and can be easily integrated in your daily life, at home and at work. 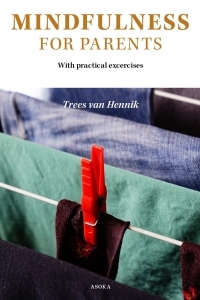 For years, Trees van Hennik was a manager and educator in a large mental healthcare organisation. She gave preventive courses un stress reduction, burnout and other mental problems. Trees is a mother, educator and qualified mindfulness trainer. In 2008, she founded Mindstudio, a centre for mindfulness, psychotherapy and coaching of children. She is also a teacher with Yoga Minds.